Fundyng.com and its partners have backed more than 35,000 businesses in their times of greatest financial need when banks have refused to lend. With backgrounds as operators businesses small and large, we understand that access to capital should empower your business and not distract it. 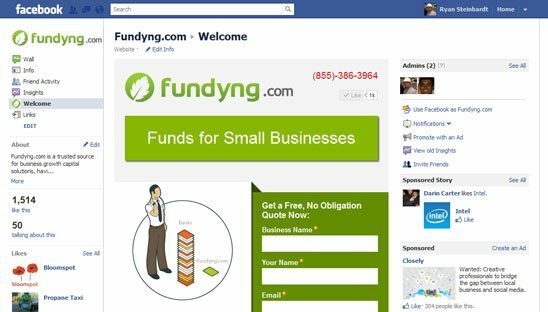 Fundyng.com can help you obtain the money you need to run and grow your business. We wanted to get a nice clean professional Facebook page and at the same time incorporating Fundyng’s green. This advanced Facebook tab is coded in a wordpress backend system. The page has a custom slideshow created where Fundyng can go into the backend system and add the image, title and description with ease. The form is pulling from the action script supplied to us and we also made the “error message” page and “thank you” page show up in the same self facebook iframe after the form is submitted. A very cool feature this page has is located at the bottom section. We used a custom jquery menu which allows the information at bottom to change when you click on a different menu buttons. And once again, everything can easily be edited by the user in the backend of the WordPress CMS.